Our video analysis project moved into it’s second phase in July, heading out to Chamonix then Briancon to video the IFSC World Cups and analyse the movement of some of the top climber in the world. The aim of this was two initially test two hypotheses reached from the initial pilot studies. 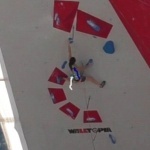 The first that top climbers positioned their centre of gravity more directly under their hand than lesser performing climbers. 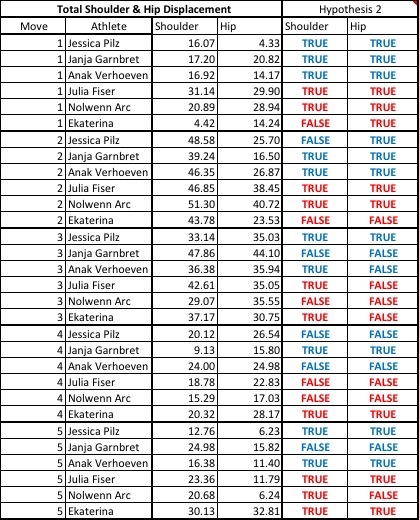 For the purpose of the study the top climbers where categorised as those finishing in the top 3 positions in semi-finals and the lesser performing climbers those finishing in bottom 3 positions in semi-finals. So still pretty amazing climbers! The two points used for centre of gravity were opposite hip to hand and same shoulder as hand. 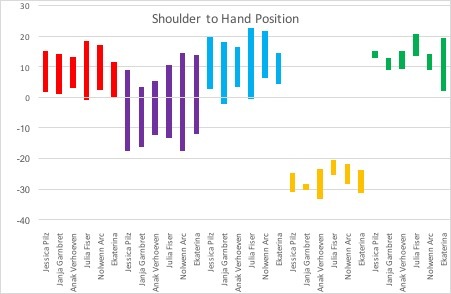 Hypothesis two was that we would see the top performing climbers move their shoulder and hips less than lesser performing climbers, suggesting greater stability / strength. 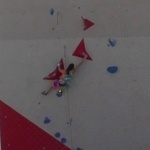 The climbers assessed where the same as for hypothesis one. 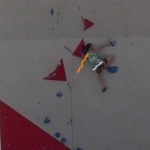 The data was collected using a video camera shooting at 50 frames / second placed as perpendicular to the climbing wall as possible at a distance that took in the entire wall without the need for zooming or panning. The data was analysed using Kinovea which uses semi-automated tracking to plot the path of each selected joint. From the video 5 moves were chosen to analyse. These 5 moves are shown in images 1-5. Images: Moves 1 -5 in order. The data was then collated in excel and displacement was worked out for both the hip and shoulder. 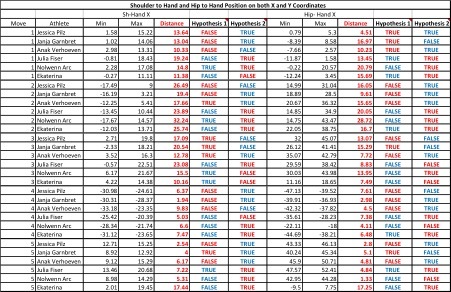 Hypothesis 1 was assessed by whether the it was true based on the result of each top athlete compared against the scores of highest scored (furthest position from hand) of the two out of three of the lesser positioned athletes. This was then reversed for the lesser positioned athlete compared against the high positioned athlete. Hypothesis 2 was assessed in the same way. The hypothesis where also assessed as True or False against an average score as well. 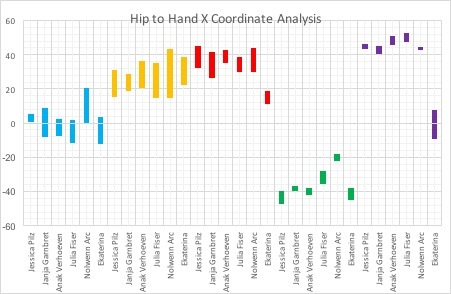 Table 1 Looks as the athletes scores based on relationship of the shoulder to the hand along the X axis and for the Hip to Hand based on the X axis. The distance between the minimum score and maximum score is shown as ‘Distance’. Whether the results supports (TRUE) or doesn’t support (FALSE) the hypothesis is shown as well. Table 1: showing the minimal and maximal scores on the x axis for the athletes as well as the distance travelled in relation to shoulder to hand position and hip to hand position. Table 2: Displacement scores of the shoulder and hip. In Table 2 we can see the total displacement of the Shoulder and Hip, this is based on scores from both the X & Y axis, so is a 2D analysis of movement. Whether the score supports (TRUE) or doesn’t support (FALSE) the Hypothesis is also shown. Table 3 looks at it from a simple count from the data in Tables 1 and 2. Table 4: Shows the hypothesis count based on average scores. The data strongly supported hypothesis 2 in which we hypothesised that top athletes would move less than lesser performing athletes. In this study, we are still looking at some of the best climbers in the world so to spot such a clear distinction is really interesting. That hypothesis 1 was so clearly rejected, proposing the top athletes would have a better position of their centre of gravity / body position opens up many interesting ideas on how they are basing their movement to climb better. The fact that their centre of gravity is often further away from their pivot point (hand) suggests they are basing their movement much more holding strong static positions and so minimising larger moves as much as possible. This is then support by the confirmation of hypothesis 2. The big question is what is the key component that lets them climb in this way. Is this a technique issue which is developed on the wall through coaching or is this slight difference in technique due to greater strength / stability in the shoulders, hips or core. Although much more research is needed into the underlining components that allow top athletes to climb in this more stable manner as coaches we can adopt many practices to help our climbers develop towards this. With youth climbers, a Constraints led approach to coaching in which routes are chosen or set to help develop the build-up of the centre gravity then as short a move as possible will be key. Ensuring the skills that support this are the fundamentals of early athlete development. In the back ground, we need to constantly physically challenge athletes to develop the strength and stability to hold these positions. This needs to be year on year through a well-structured long term athlete development model with a strong emphasis on strength and conditioning. The athletes in this study didn’t develop these attributes overnight and as coaches we must have a long term view on our athletes development. 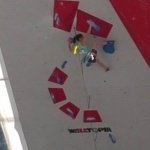 This is hopefully the first part of many different analysis into climbing movement. 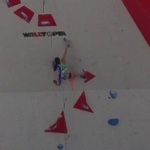 I’ve more footage from the World Cup in Briancon to work through and will hopefully keep throwing up more ideas to make us all better climbers. I also appreciate that my write up is very superficial, so please do get in touch to discuss further.